Seventeen swimmers bravely showed up for and completed a 5K or 10K ePostal on May 26th in the Amazon Pool in Eugene, Oregon. This year showed the best turnout yet since 2014, the year we started this opportunity, and we were blessed with a beautiful warm and sunny day for swimming (perhaps a bit too sunny judging by the sunburn some of us got)! A huge congratulations goes out to everyone who tackled one of these long arduous swims. In my opinion, these are the most challenging USMS National Championship swims of the year, both mentally and physically (especially the 10K) whether in the pool or in the open water. Anyone who does these events should be proud to be one of the few people to achieve a finish in these demanding swims. Since 2014, Oregon Masters Swimming has been renting the Amazon Pool in Eugene, Oregon, for 4 hours on one of the final weekends in May in order to allow swimmers an opportunity to swim their 5K or 10K USMS ePostal National Championship. This year we had the pool from 2pm to 6pm on Saturday, May 26th. Finding pool time to swim 10,000 meters (or even 5000 meters) in a long-course configuration (the 5K and 10K must be swum LCM) is next to impossible for many people, so this gives long-distance swimmers a great opportunity to do the swim without having to fight, beg, or steal to get pool time. Our wonderful OMS board has voted to subsidize 50% of the rental cost each year and the rest of the cost is paid by the swimmers who participate and contribute $20 each to swim. The turn-out, geographic distribution, and performances for this event were successful in every way. Swimmers came from as far south as Ashland, Oregon, and from as far north as Seattle, Washington. There were five swimmers over the age of 70! The youngest swimmer was 24 year-old Erin Cavender, who set a new Oregon Record in the 10K with a time of 2:33:17. The oldest swimmer was 96 year-old Willard Lamb, who swam his way to a new Oregon and National record in the 5K with a time of 2:08:06…at 96 years old!!! What?! Truly amazingly impressive, everyone agreed. Bob Bruce broke the 10K Oregon and National record for men 70-74, going 2:46.09, but, due to Dan Kirkland starting the event after Bob, Bob held the National record for just 15 minutes. Dan Kirkland posted an incredibly fast time of 2:34:31, bettering the new National record for men 70-74. Congrats to all of the new national record holders! Two other Oregon records were set, one by Sara Shepherd who swam her 10K in 2:31:42 and the other by me (Matt Miller) who completed a 10K in 2:17:34. We plan to offer this 5K/10K opportunity in Eugene again next year. I would strongly encourage everyone to consider doing one of these two long swims at this venue next year. It works really well as part of a regular annual training cycle to kick-start the long course and open water seasons, and provide you with a good way to measure your fitness level heading into the season. Being aware of this opportunity, you can watch for it next year! Full (mostly complete) results from everyone’s swims are listed below. Again, I would like to personally congratulate everyone who did one of these daunting swims, especially those who did it for the first time. You all did great!! 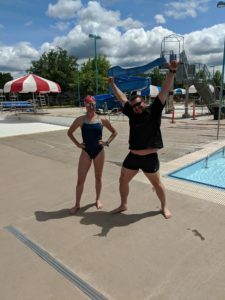 I hope to see everyone come back next year and welcome more new faces in the pool trying their first 5K or 10K ePostal swim at Amazon Pool in Eugene. Impressive swims, Oregon masters! I enjoyed reading this article, Matt. Perhaps the 10k can be held earlier in the morning to avoid sunburn, or swimmers can wear a thick coat of Badger/ or a pure zinc oxide sunscreen. This is the first year we’ve done this swim that it was so intensely sunny and warm. 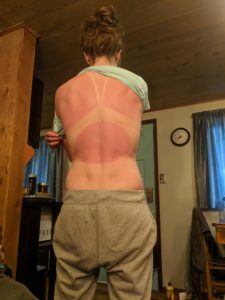 Usually, in late May the weather is a bit cooler and sunburns are less of an issue. The reason we do the swim mid-day is so that most people can make a day trip out of it instead of having to spend the night or get up at an unreasonably early hour. Most people drive quite a distance to do the swim. It’s pretty hard to find a sunscreen that will last over 3 hours. 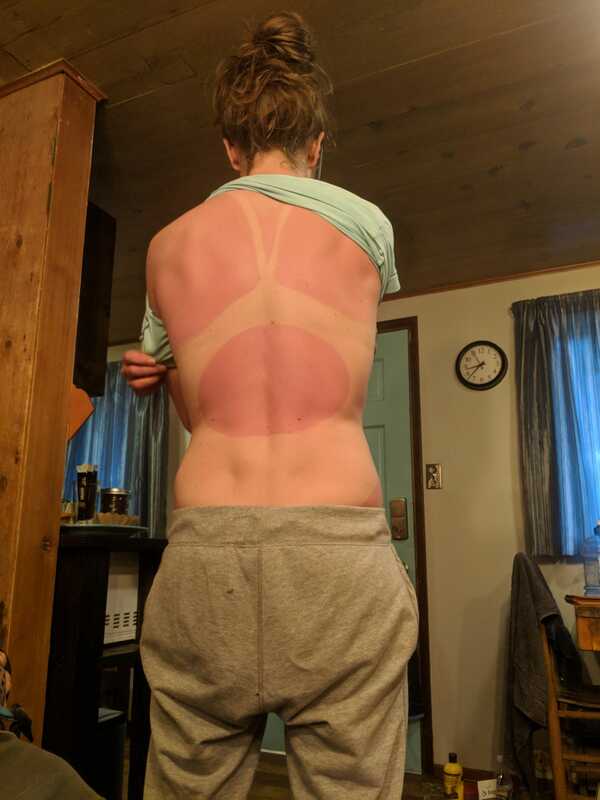 When I do the 10K I plan on STOPPING, GETTING OUT, waiting for my back to DRY, and putting on MORE SUNSCREEN partway through the swim. Sounds like a good excuse to rest! Haha, for sure Jeanna! Yes, I think everyone put on sunscreen but it was so warm and sunny that it didn’t last the whole 3 hours for most people. I think the really thick white stuff zinc oxide might last the whole time, as I’ve seen people doing super long swims with it, but I’ve never purchased or tried any myself.